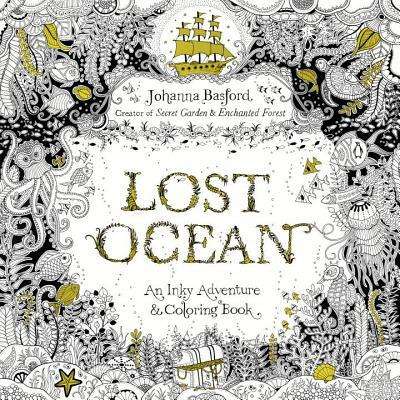 With this coloring book for adults, Johanna Basford invites color-inners of all ages to discover an enchanting underwater world hidden in the depths of the sea. Through intricate pen and ink illustrations to complete, color, and embellish, readers will meet shoals of exotic fish, curious octopuses, and delicately penned seahorses. Visit coral reefs and barnacle-studded shipwrecks, discover intricate shells and pirate treasure. Secret Garden and Enchanted Forest fans and newcomers alike will welcome this creative journey into an inky new world. For Lost Ocean, Johanna picked a crisp ivory paper that accentuates and complements your chosen color palette. The smooth, untextured pages allow for beautiful blending or gradient techniques with colored pencils or are perfect for pens, allowing the nib to glide evenly over the surface without feathering. Johanna Basford is an illustrator and ink evangelist who prefers pens and pencils to pixels. Her intricate, hand-drawn illustrations are loved the world over by those who have colored in (sometimes more than once) her bestselling books Johanna's Christmas, Magical Jungle, Lost Ocean, Secret Garden, and Enchanted Forest. Johanna is a graduate of Duncan of Jordanstone College of Art and Design in Dundee. She likes sugar mice, floral teacups, peonies, and bumblebees. Visit her online at johannabasford.com.